My Money Mission: Kielbasa, It's What's for Dinner!! 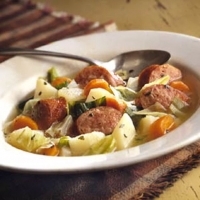 In a 4- to 5-quart slow cooker combine cabbage, potato, and carrots. Top with kielbasa. Sprinkle basil, thyme, and pepper over kielbasa. Pour chicken broth over all. Doesn't it sound delish?? What have you made in your Crock pot lately? Oh, it's a "fall" dinner! Already??! Sigh. Summer went too fast. Yummy! This is one of our favorite recipes .... 'cept ours has onions in it. We made chicken & dumplings in the crock pot yesterday! And kielbasa last week with saurkraut and potatoes.